Binary IT believes in creating 24/7 on-going path for your business. It excludes the factors hindering your business. For eg: Machines and Hardware Crash, Humans error and Issues of unpredictable nature. Binary IT has collaborated with few leading reliable vendors like Veeam and Storage craft with the motive to secure and restore your data when required. Data Protection with integration for Microsoft Office 365 and Microsoft Azure. Guidance on improvising data storage and availability in Hybrid cloud. Protection of Confidential data from ransomware and loss. 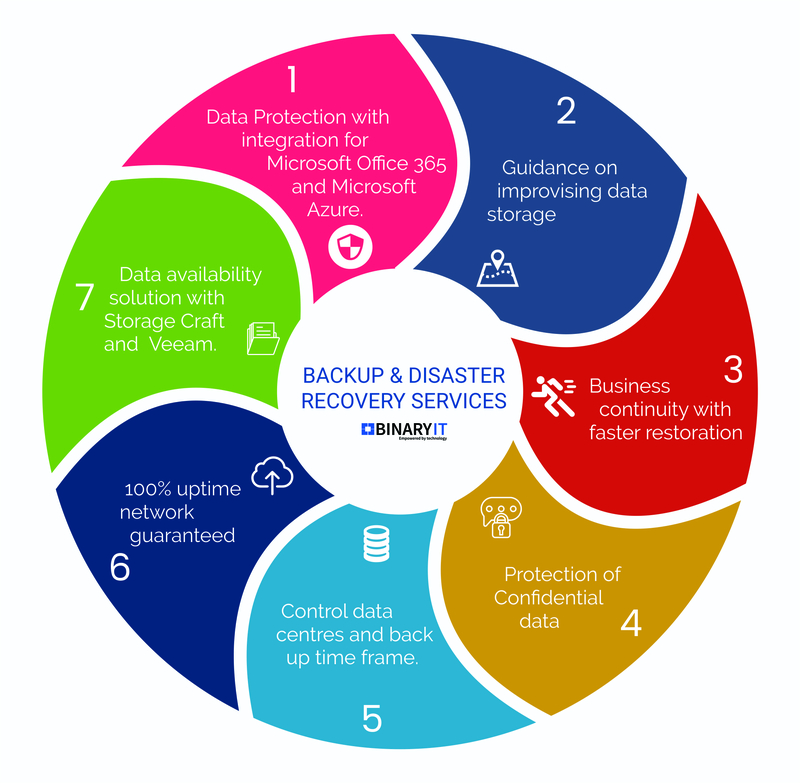 Business continuity with faster restoration from backups. Control your data centres and back up time frame as per your location. High performing servers as per resource requirement. Data availability solution with Storage Craft and Veeam. 24/7/365 days phone, mail and chat support. For queries and further service detail Contact Us! Veeam virtually replicates and backup your data in DRaaS from the cloud. It directly integrates the hosted cloud repositories into Veeam backup support site. It is flexible, cost-effective and user-friendly. Storage Craft eliminates window back up but makes back up a swift process and store in SaaS. It protects your Linux and Window system with one backup software solution. It restores the documents from a point in time image backup. It creates a temporary virtual machine till the original system gets restored. It starts a restore option even before the disaster hits.